Water spray deluge systems are typically used in hazardous environments where fires may spread very quickly or where valuable equipment surrounding the fire needs to be cooled. These systems are designed for use in a variety of special hazard applications. 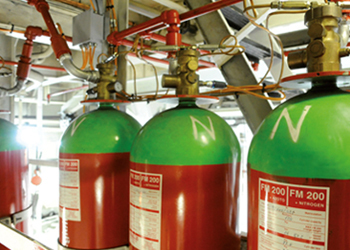 Many types of nozzles may be required to provide a properly designed special hazard fire protection system. When it comes to managing the complexities and dangers of industrial facilities, no other company has our depth of experience, knowledge, skills or technology. Water spray deluge systems have been an effective defence against fire. Gielle’s advanced technology takes this simple idea to a new level. At the heart of our systems are specialised spray nozzles, positioned at the correct location, to quickly bring fire under control and stop it spreading. Designing a modern spray system requires skill, experience and an eye for detail – it is much more than connecting a few nozzles. A number of variables need to be considered: the location of piping, the distance of the sprayer from its objective, the available water pressure, the effects of wind/draft, ambient temperature, concentration of chemicals, gas/chemical velocity and the corrosiveness of the environment. Water spray deluge systems must only be designed by experienced professionals who thoroughly understand the capabilities as well as the limitations of the equipment. Gielle can custom design and install a new fire system for most facilities or we can refurbish and upgrade your existing system. 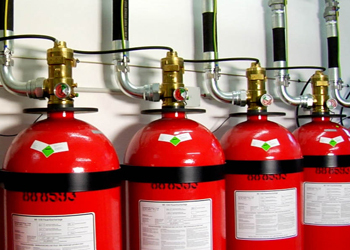 We have significant expertise in installing large scale fire systems in complex environments with minimal interruption in industries which cannot afford to halt production. Water spray nozzles are designed to spray water directly onto the hazard surface via a series of nozzles with a carefully predetermined spray pattern. They are suitable for a variety of special hazards including transformer, turbines and combustible liquid hazards and systems can be individually tailored to your needs. High velocity systems are often used to protect equipment that incorporate heavy or medium oils; equipment such as transformers, circuit breakers, diesel engines and fuel oil storage tanks, turbo alternator lube oil systems and oil fired boilers. The high velocity nozzles are specifically designed to discharge a jet of water at high speed. The water jet forms a cone of coarse spray of uniform density which is discharged over a defined area. The coarse spray is able to penetrate the flame zone and reach the surface of the burning oil. The turbulence created by the high velocity spray forms an oil-in-water emulsion on the surface of the oil that will not burn. This “emulsification” is the principal way the fire is extinguished, along with a cooling and smothering effect. The shape of the spray cone, the fire area contacted and the water flow is all controlled by the nozzle specifications – the orifice size and the shape of the internal swirl plate – along with the water pressure and the orientation of the nozzle. Medium velocity sprayers discharge a water spray of finely divided droplets at medium velocity. They are ideal for protecting hazards involving light oils where emulsification from high velocity sprayers is not possible. The fine spray has a high heat absorption rate so medium velocity sprayers are an effective method of protecting adjacent plant and structures from heat during a fire by providing a continuous cooling spray over the exposed surfaces. Keeping nearby equipment cool minimises damage and reduces the risk of explosion. Medium velocity sprayers can be used in combination with other fire fighting systems – dry chemical and foam can be used effectively under the discharge. The fine spray also works to dilute and disperse flammable vapours. The sprayers use an external deflector to achieve the desired discharge angle and spray characteristics. Gielle engineers will select the correct sprayers with flow rate, discharge angle and droplet size to best suit your application. Medium velocity sprayers use water economically and so can be used for long periods if required. Water Mist is a versatile and highly efficient fire-fighting medium. What differentiates Water Mist from traditional water based systems is its reduced droplet size. When a droplet of water vaporises, it expands by some 1,600 times. Because heat absorption is a function of surface area and not volume, smaller droplets mean more surface area and therefore faster heat absorption. Water Mist has the unique ability to deliver water as a fine atomised mist. This mist is quickly converted to steam that smothers the fire and prevents further oxygen from reaching it. At the same time, the evaporation creates a significant cooling effect of combustion gases and blocks the transfer of radiant heat. In this way, Water Mist combines the fire suppression properties of both conventional water-based deluge or sprinkler systems and gaseous fire suppression systems. 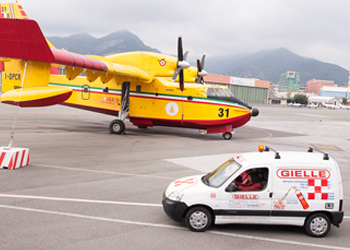 Utilising the unique properties of Water Mist, Gielle offer both a low and a high-pressure version of Water Mist applications to provide your facility with the right solution in the event of a fire.